This is a great baby shower gift for a boy, girl or those times when the baby�s gender is not yet known. 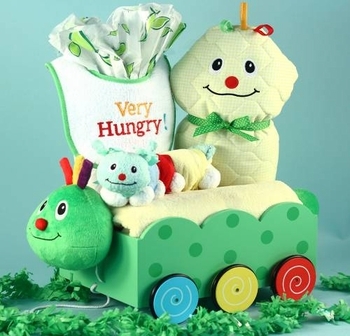 It features a unique wooden play wagon with a cute little caterpillar design including a plush head and tail added to it! You can also have the side of the wagon personalized with the baby's name in white vinyl letters. Sure to become one of baby�s favorites, the wagon is constructed of wood with a pastel green painted finish, multi-colored wheels and a pull rope for easy transport of toys around the house. In the wagon we add a coordinated diaper changing pad, plush minky baby blanket, an embroidered cotton bib and more. Each is caterpillar themed and made right here in the USA with unsurpassed quality. To complete this beautiful presentation, we carefully wrap each wagon in shiny tulle material before shipping it for free!